Greetings members and friends, welcome to the AGM of Unite Waitemata. Tēnā koutou , tēna koutou, tēnā tātou katoa. All our remits were passed at Unite AGM on 26-26th November 2013. 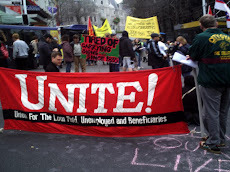 · Unite calls for minimum wages and benefits to be at the level of a living income. · Unite Calls for One Year’s Paid Parental Leave. · Unite calls for all carers of their disabled adult family members to have the right to be employed by the state on a living wage. · Unite Calls for Working for Families Tax Credits to be extended to Beneficiary Families. 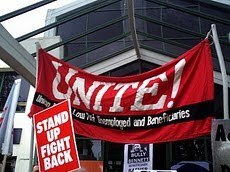 · Unite opposes all benefit sanctions. · Unite opposes compulsory drug tests, compulsory training, working without pay, compulsory childcare and compulsory medical visits for beneficiaries and their families. 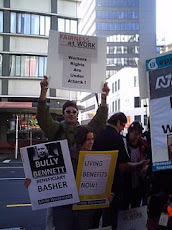 · Unite opposes work testing of parents, the sick and disabled. · Unite opposes the use of WINZ trained designated doctors to provide alternative diagnoses to the diagnosis provided by the beneficiary’s own doctor. 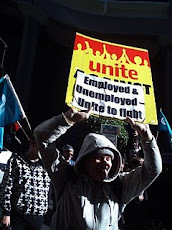 · Unite opposes “income management” for youth. 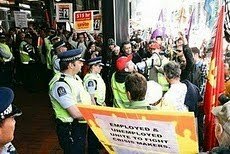 · Unite opposes contracting out WINZ functions to private providers. · Unite calls on the Government to create real jobs for those that need them. Early this year Ivan and I attended the first meeting of the new Unite executive. We had been invited to attend by Unite President Gerard Heihir, to help decide how to implement the remits. We suggested having a paid organiser for beneficiaries, and publishing a link to our branch on the Unite website, but we were told we were just asking for money. Nothing was decided. The Vice President was meant to get in touch with me so we could make further plans together. But he didn't do this, and I didn't hear back from Gerard Heihir. People have come to our meetings and joined the branch after I helped them with advocacy as a Unite peer advocate , and sometimes as an advocate at a local community organisation where I have been working. People have come to our meetings after meeting us at public events such as pickets and demonstrations. We had a visit in January from Julie Whitehouse from the Auckland Single Parents Trust. We met Julie at a demonstration outside a National Party Christmas Party at Auckland Grammar School last December, organised by Auckland Action Against Poverty. Later in the year Julie 's political differences with us became apparent, when she publically supported the Government's work focus for single parents. In February the branch had a visit from the Unite Secretary Matt McCarten. As it turned out, this was just before he left Unite to become the campaign manager for David Cuniffe and the Labour Party. On March 8th, I celebrated International Women's Day on our behalf by taking some placards to the Poverty Spoons display in Te Atatu People's Park. 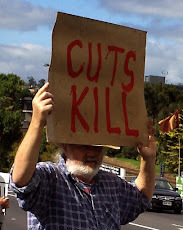 On the 26th March we held a successful protest at a public meeting for Paula Bennett at the Kelston Community Centre. We met Christina Faumuina, a Labour Party member and former SFWU delegate , who spoke very eloquently at the public meeting. Christina attended our next meeting and joined our branch. We held a successful forum at the Trades Hall to celebrate May Day. In August I participated in the Auckland Action Against Poverty Impact at Mangere WINZ. . I was shocked at the level of poverty and hardship that so many people were enduring. I have continued to maintain our facebook pages. The Waitemata Unite Group has 212 members. Our website is waitemataunite.blogspot.com. Keith has been contributing to it this year. It has had 46, 664 page views in all time, and 3451 page views in the last month. Some of us continued to informally support the Mana Movement, and the newly formed Internet Mana Party during the election campaign. We had more formally supported Mana during the previous election. The defeat of Internet- Mana (and the possibiity of a Labour led government) and the triumph of National at the elections, with their declared intention of reducing the number of beneficiaries by another 25% is a big concern for us. Poverty levels are soaring. Child poverty was an election issue, which National gave some lip service to, but appears to have already decided to do nothing about it. Housing is at an absolute crisis with many families living in cars and garages. Keith and some of our members have been active supporting state housing tenants' struggles this year. That's the end of my report . I hope you enjoy the rest of the meeting. Tēnā koutou, tēnā koutou , tēnā tātou katoa.